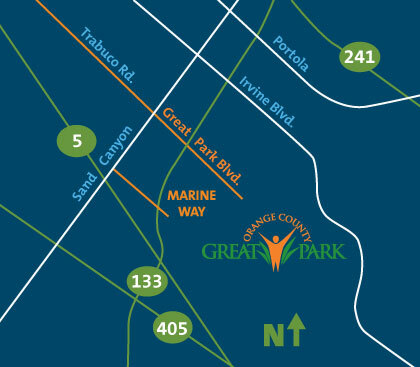 The Orange County Great Park has entry points at Marine Way, Trabuco/Great Park Boulevard, and Ridge Valley. View a high-resolution map with parking guide here, and see detailed driving directions below. General park hours are 8 a.m. to 10 p.m. daily. Special operating hours may exist for different park facilities and amenities, and hours may vary on holidays. Please see detailed information on park hours below. For questions, give us a call at the Visitors Center at 949-724-6247. The Orange County Great Park is located at 8000 Great Park Boulevard, Irvine. The Great Park is growing, and many GPS systems, online maps, or directions other than those provided on this website are not reliable. Please reference the directions and map below. General Areas1 8 a.m.–10 p.m. 8 a.m.–10 p.m. 8 a.m.–10 p.m. Visitors Center 10 a.m.–8 p.m. 10 a.m.–10 p.m. 9 a.m.–10 p.m.
Carousel Closed 10 a.m.–10 p.m. 9 a.m.–10 p.m.
Farm + Food Lab 10 a.m.–3 p.m. (closed Mondays) 10 a.m.–3 p.m. 10 a.m.–3 p.m. Artist Studios Closed Closed 10 a.m.–4 p.m.
Gallery Closed Noon–4 p.m. 10 a.m.–4 p.m.
Heritage and Aviation Exhibition3 Closed Noon–4 p.m. 10 a.m.–4 p.m.
3 Exhibition hours may vary occasionally due to private events. Lost? Need up-to-date exhibit hours or balloon flight information? Call the Visitors Center at 866-829-3829 (toll-free).